I regularly use apps for teaching and learning. Apps that are quick, simple and easy to use but have an impact in the classroom. WordFoto does that. The app does cost £1.49 but in my opinion it’s a good investment! I have previously blogged about WordFoto and other apps for education in a collaborative post with Mark Anderson, which can be found here. This is a re-blog post originally posted by Kate Jones and published with kind permission. I recently presented at the Jumeriah English Speaking School in Dubai, JESS Digital Innovation Summit, where I discussed and shared various WordFoto examples. I wanted to share on my blog different ideas and examples how this app can be used in the classroom across the curriculum. 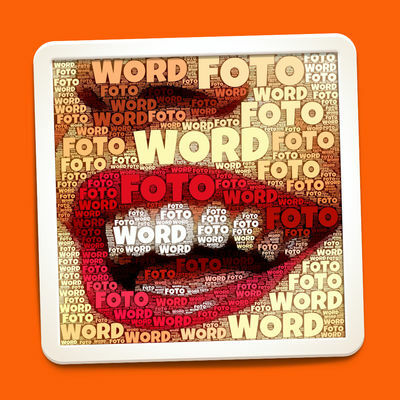 The app allows you to combine a photo with words, using different styles, fonts and features. The image will need to be on your camera roll or there is the option to use the camera in the app. There is a section “Add new word set” and then you add any words of your choice. There is a word limit of ten words. However, the fewer words used the more they will be repeated and visible in the image. I think that too many words can be lost in the image so for more impact input fewer keywords. Words are also limited to twelve characters, as the app states ‘shorter words often look better’. Despite those factors this is a very clever app that can create visually impressive and beautiful typographics. A WordFoto is a great way to start the lesson and act as a powerful hook for learning. It is eye catching and can lead to class discussion with questions linking to the lesson outcomes and subject content. 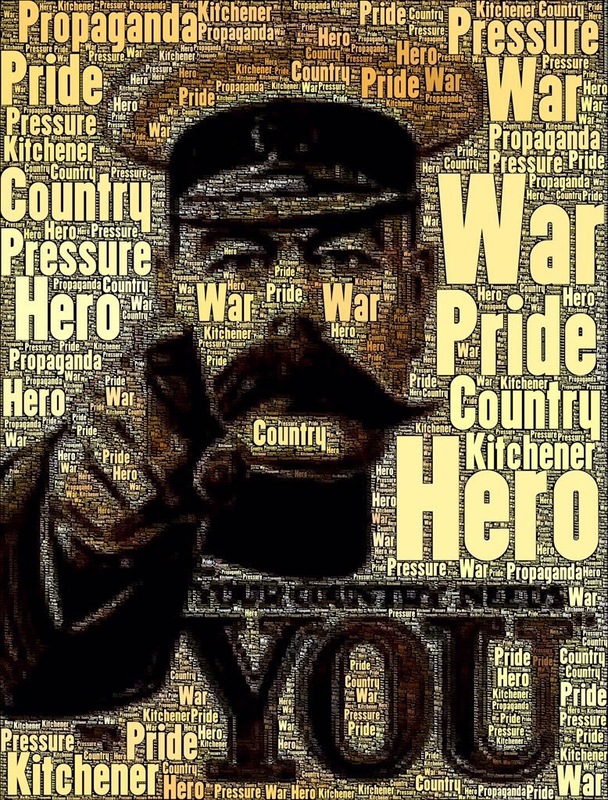 The example below was shown at the start of a Year 9 lesson, beginning a new topic focusing on recruitment in World War One, using the well known Lord Kitchener poster. This promoted discussion about the topic, questions about the image, keywords and how are they connected. This can be used for pupils to discuss what the lesson will be about before sharing outcomes and gauging what pupils already know. I often write about a hook for learning at the start of a lesson but I think there should be a good hook at the end of a lesson too, when reflection and assessment takes place. Towards the end of a lesson pupils can become distracted, especially just before break, lunch or last lesson of the day. 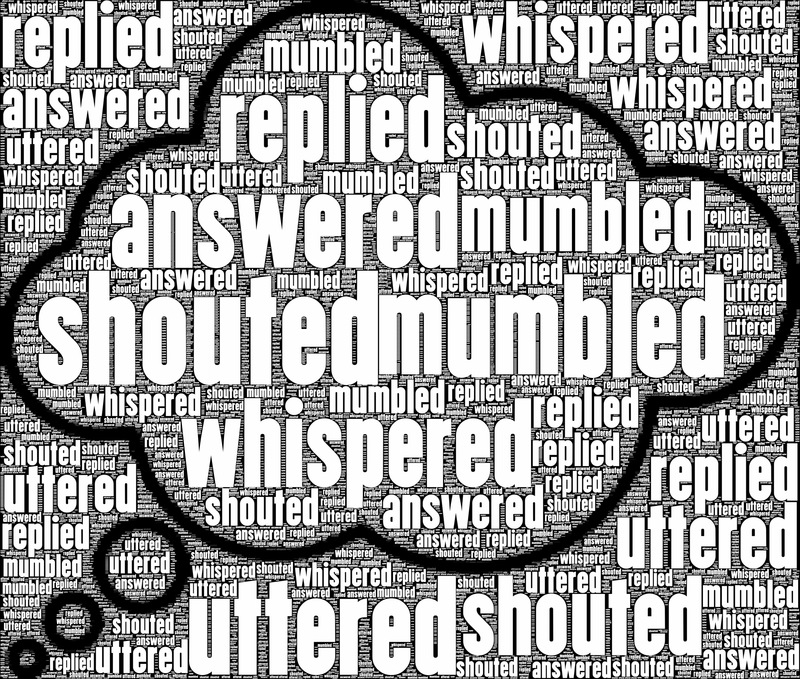 A WordFoto draws attention to the image to reflect on the lesson with keywords used in the lesson, discussed and an opportunity for further questioning and linking to next lesson. If pupils have access to a device in the lesson they could create their own Wordfoto that provides a summary of what they have found out using keywords and a relevant image they have selected. 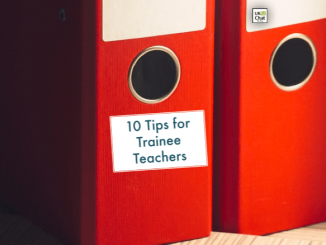 I have previously blogged about different resources and strategies to help develop understanding of subject specific terminology, Getting to grips with keywords which can be found here. Again, this app alows the teacher or pupil to include subject specific vocabulary and find an image that is connected which can help put the keywords into context. This can also encourage pupils to use keywords within their written work throughout the lesson and in their discussions with other pupils. Pupils love this app and can often very quickly grasp how to use the app! Allowing pupils to create their own WordFoto can check their understanding of the topic, content and keywords. Pupils can also show how creative they can be. Pupils can share their WordFoto with their peers discussing/explaining the images and words they selected. If you do not have access to a class set of devices then you could create a WordFoto together as a class by showing a photo to pupils and asking for adjectives to describe what they can see. The teacher can very quickly add the words to the photo and a class WordFoto creation is made! Pupils are often very impressed with the speed and ease as well as the design. The example below by a Year 7 pupil is brilliant! 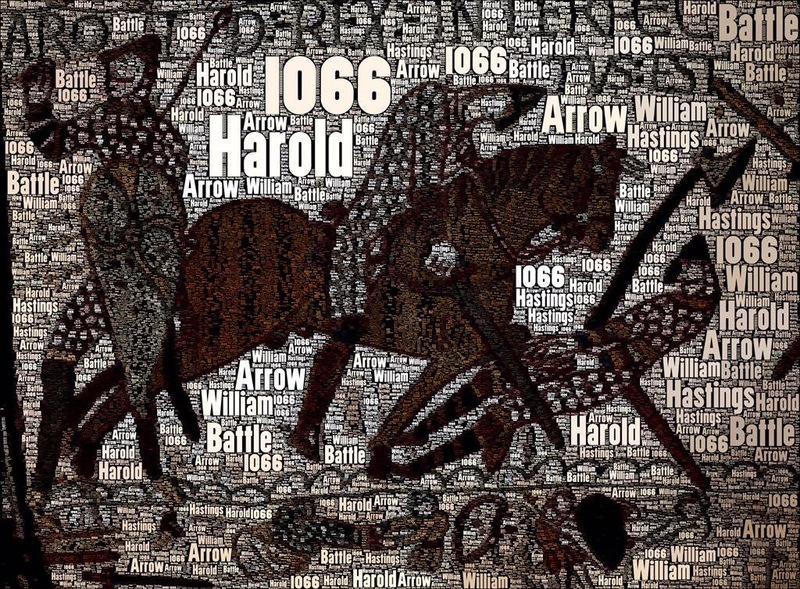 The image is taken from the Bayeux Tapestry and includes the key date and keywords connected to the Battle of Hastings. 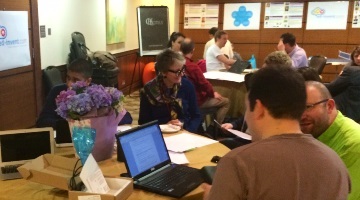 I previously taught Welsh and I often found myself experimenting with different apps for MFL. Again, this app lends itself very well to MFL as you can create your own WordFoto using different words in any language. Do you recognise any words? Can you say any of the words? What do they have in common? What are we learning about today? Can you write a paragraph including the keywords or have a conversation including the vocabulary? The example below focuses on Welsh words associated with School and the different school subjects. 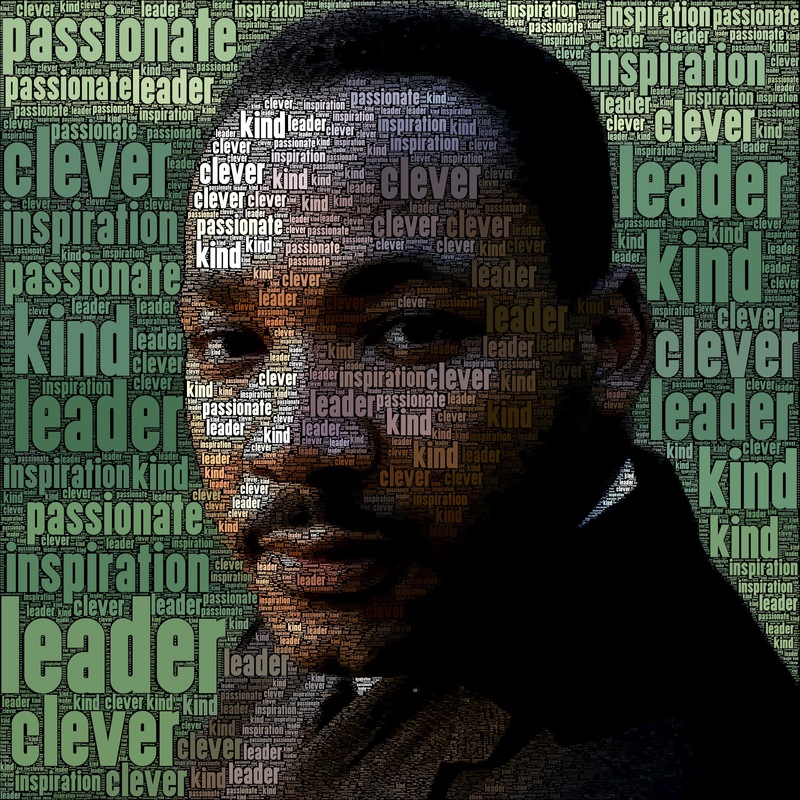 WordFoto images can be a great way for pupils to describe individuals, characters or even themselves! In History this works well when studying well-known historical individuals and to describe their qualities, achievements or associated keywords. This can be also used linking to character analysis and exploration in Drama and/or English Literature. It is interesting to see how pupils interpret different characters/people. On Twitter I have seen many examples of WordFoto and there were examples of pupils using photos of themselves and adding words that they would use to describe themselves or show their interests, hobbies, skills etc… a WordFoto self portrait. 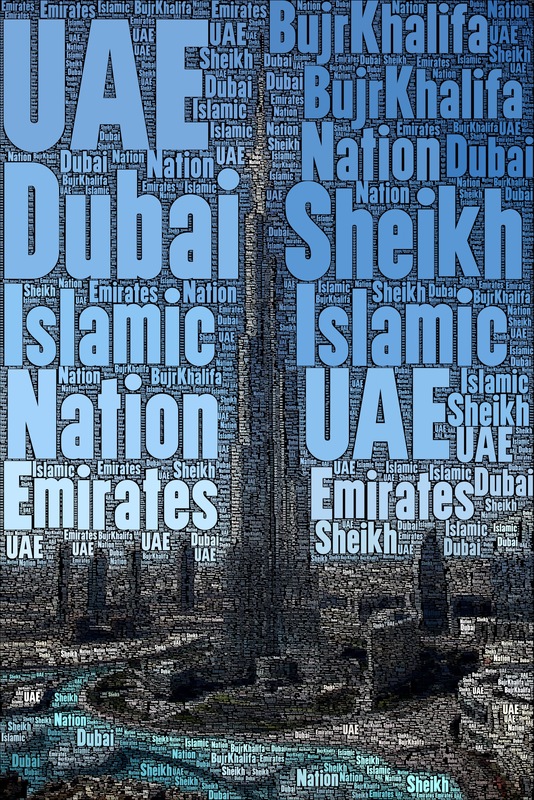 The WordFoto can be used for description across different subjects such as describing countries, different religions, cultures, objects, sports, stories etc. 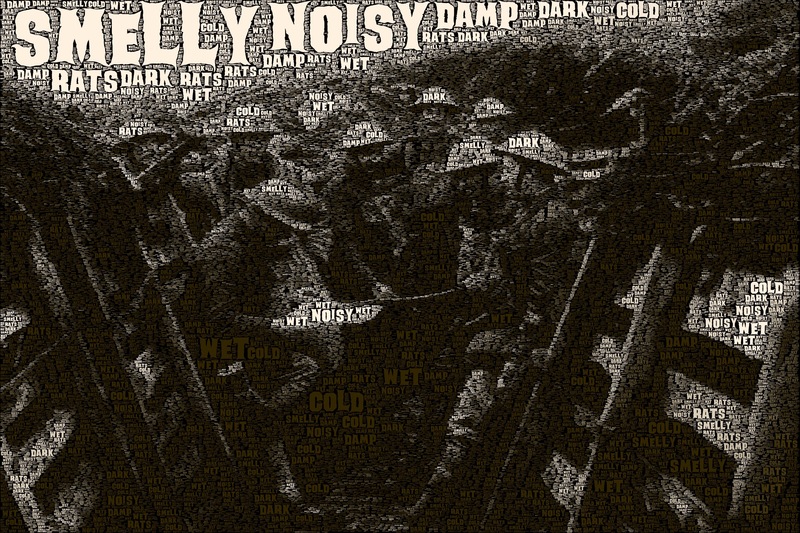 This WordFoto has combined a photo from the trenches with words to describe the living conditions, using the different senses. As you can see from the numerous examples provided the WordFoto designs can be visually beautiful and show clear connections to the learning. They are great to put on display to represent topics studied, to make keywords accessible for pupils or show examples of pupils work if they have created their own. At Brighton College we have a pastoral House system. I am a tutor in the Fenwick House. 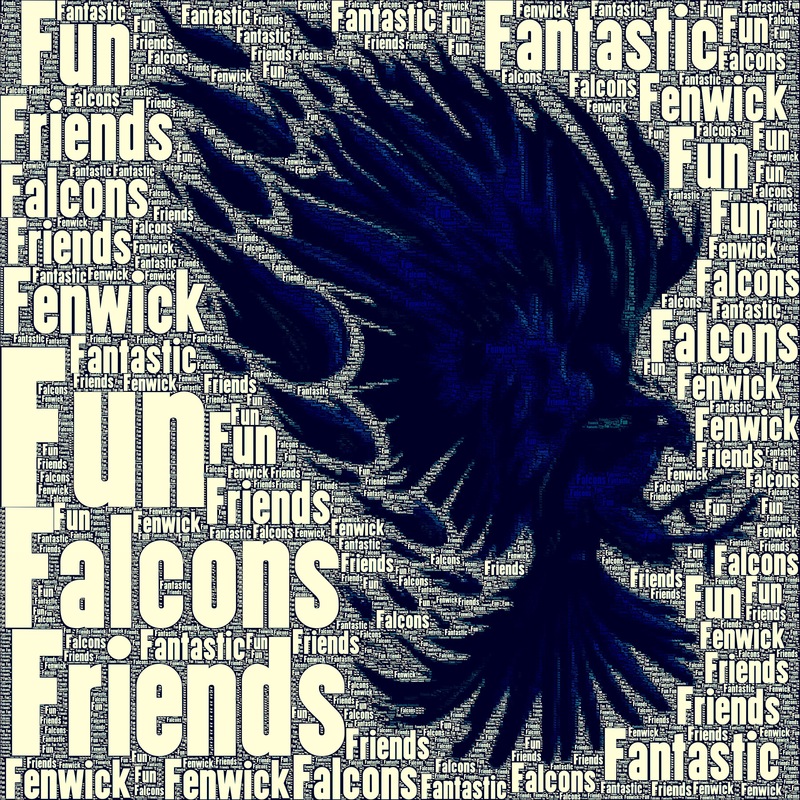 The Fenwick colours are blue, the symbol is a Falcon and I have combined these with the key values that Fenwick represent, to put proudly on display in the Fenwick area. As this app focuses on keywords it can be used to support Literacy. The example shown below are synonyms for the word ‘said’ to encourage pupils to use a wider range of vocabulary. 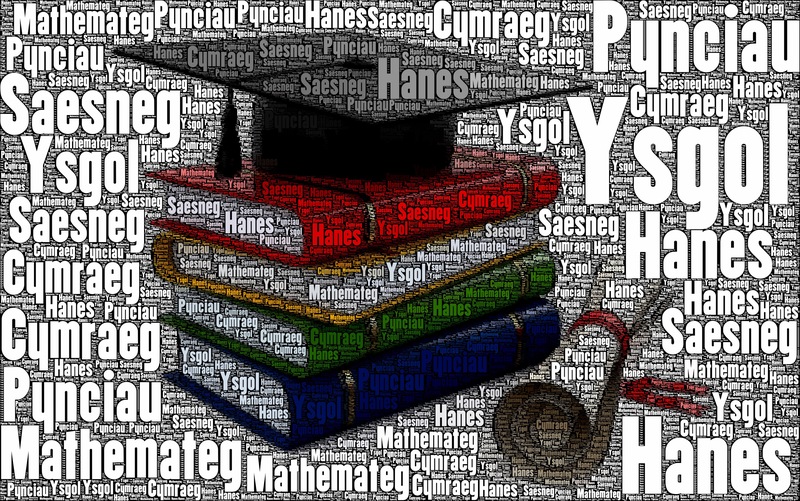 A WordFoto can also include words that pupils may struggle to spell correctly, so they can refer to the WordFoto to check spellings. The image and word combined can help pupils to understand new words in the correct context. In my previous School pupils didn’t have access to devices in the lesson. I originally used WordFoto as part of my planning and resourcing. I often created WordFoto images to include in slideshow presentations, projected onto the board in a lesson or printed and given to pupils. Pupils were given the WordFoto, shown below, to support with their writing. 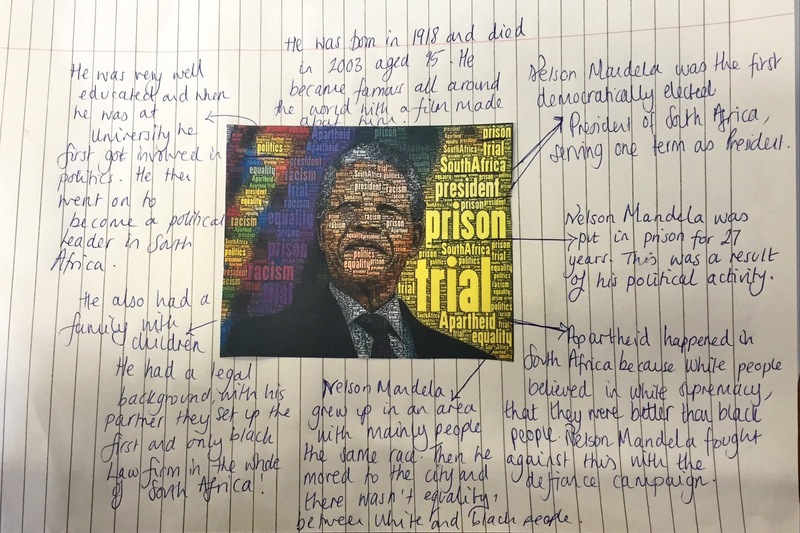 Pupils had to write what they knew/ found out about Nelson Mandela and they found the words embedded in the image useful acting as a prompt. If you have other apps in your teaching toolkit then you could experiment combining them with the WordFoto app! Suggestions include the blending of Prisma, a free artistic app, as the photo inserted into the WordFoto app. 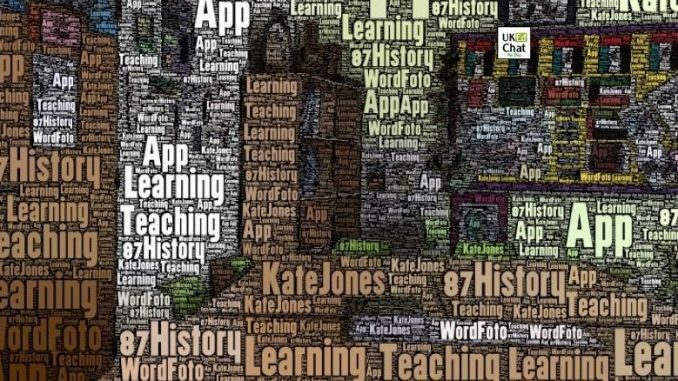 Another idea could be importing the WordFoto into a video app such as Quik or Adobe Spark Video, so pupils can talk over the image explaining the connection between the photo and keywords or what the WordFoto represents…it could even be used as a green screen background! 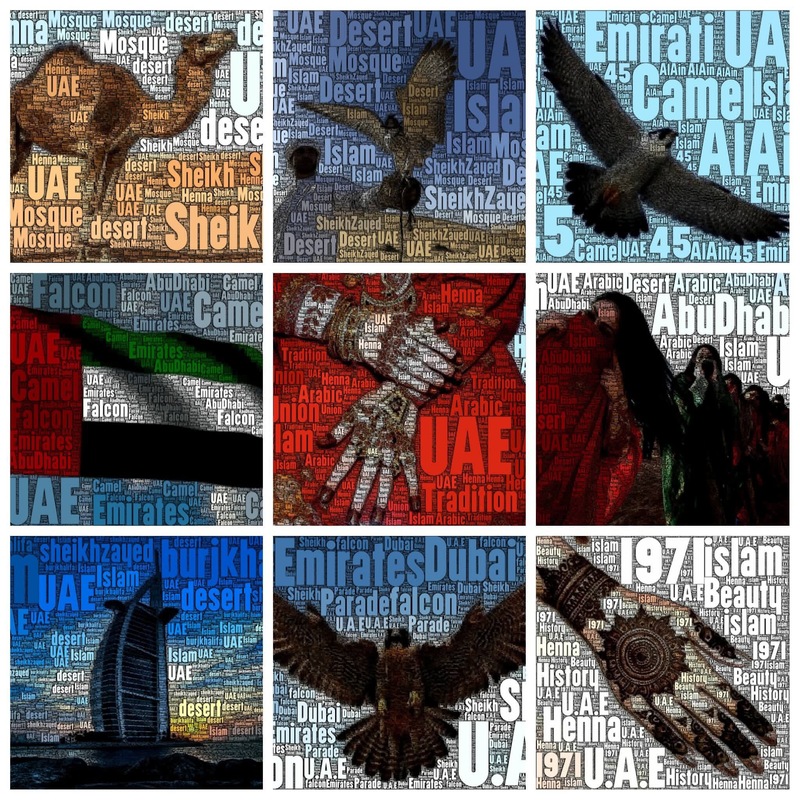 Here are some wonderful examples by my Year 5 pupils as we prepare to celebrate National Day in the United Arab Emirates. I hope this post has inspired you to experiment with the WordFoto app in your classroom and with your pupils. For further inspiration you can search WordFoto on Twitter where people regularly share their creations and there is also a WordFoto gallery online. A special thank you to Mark Anderson for introducing me to this app, as well as many others, check out his periodic table of apps! Thank you for taking the time to read my latest post. If you have been inspired to use the WordFoto app I would love to hear how you have used it in your classroom! Please feel free to contact me via my contact page or you can send me a message on Twitter.